Otagamers is open for business again! Oh no, I haven't blogged in nearly six months, I hope I still have readers! Regardless Otagamers is back, now with 100% more orange and few improvements here and there. I think I will just start with the most obvious change, new theme yay! I originally planned to have this new theme all set up by the time the blog anniversary would roll around in September. That obviously didn't plan out that way in the end. This new theme adds a lot of nice improvements such as a nice responsive design for varying display resolutions which includes mobiles devices. One area that was a problem before as the previous theme just didn't have a mobile option. Reading the blog on devices with smaller screens such as my old iPhone 4 was not what I would call comfortable. 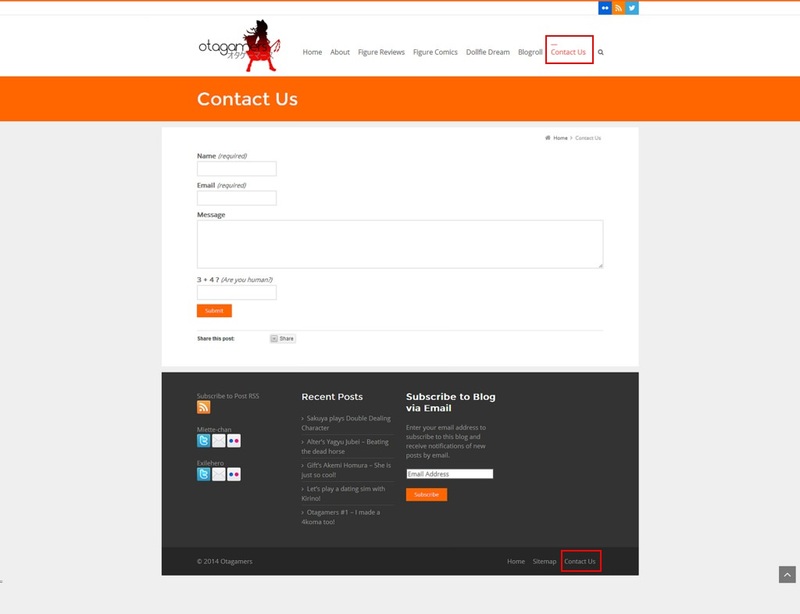 A brand new addition is a dedicated contact form, which can be accessed from both the header and the footer menus. Before I had a small icon in the footer section which you can still see above for an email link. I think the new addition of this menu item will make it more visible and easier to contact me. Contact for what you might think? 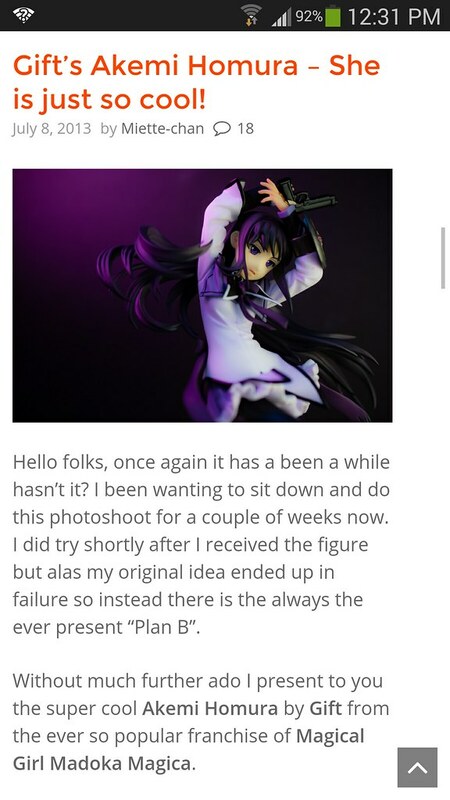 Things like link exchanges, any questions about anything about the content of this blog whether the figures themselves, props or the actual photography for example. Whatever you can think of that you might want to hear back from me. 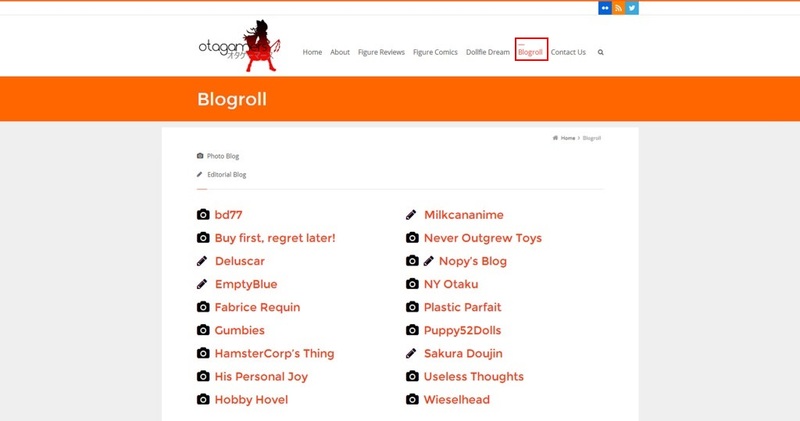 Speaking of link exchanges, I finally went and replaced my apparently not well liked blogroll menu with an actual blogroll page. Right now I just copied the more or less active members of my old list into a wall of links. I do plan to make it a more visual affair in the near future as well as actively search and add some of the new blogs that I been following lately. 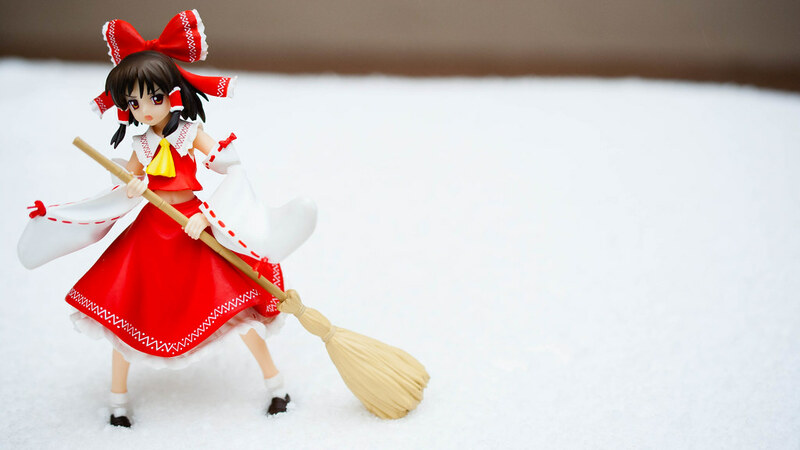 If you are reading this and have a figure or anime blog I would be more than happy to add you. 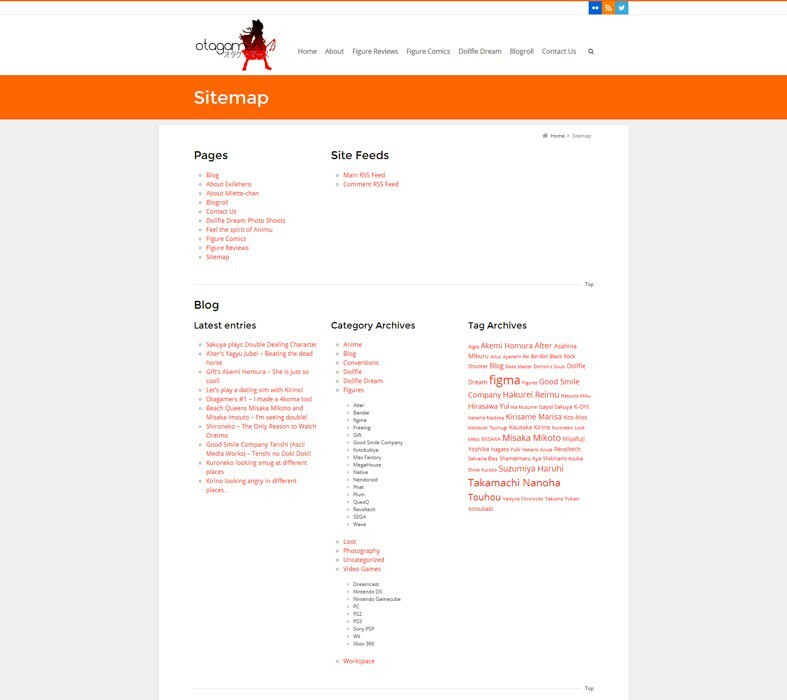 I added a new sitemap page in order to make finding content a bit more easier and as alternative to just using the search bar on the header menu. This page can be accessed from the footer menu. Now that the new stuff is out of the way. Why the long gap of inactivity? One reason was that I wanted to time this 201st post with my anniversary. As well as setting up this theme as a way to celebrate and start on my 5th year of blogging. Another reason is that I actually became dissatisfied with my current camera so I wasn't really in the mood for photography. I also ended up interviewing, accepting and moving to a new city for a new job during the later months of last year. 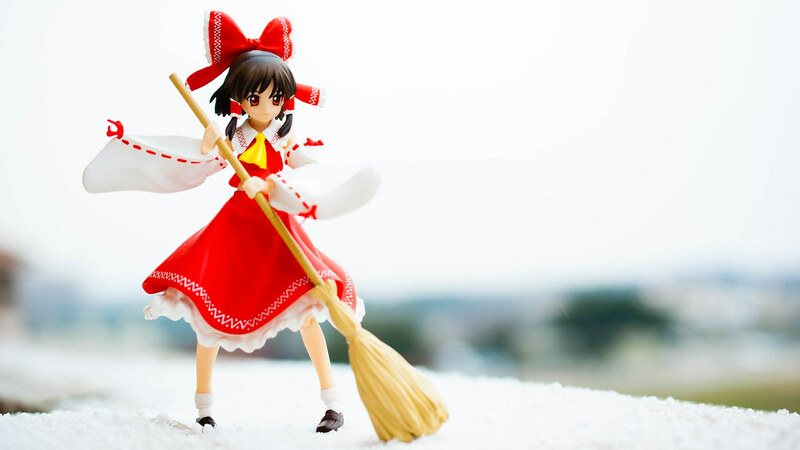 Now that I am settled in, I can start unpacking my figures, and since I have a new job I'm considering buying a new camera. I have been eying the new Sony a7 and a7r, those are some really nice cameras that do a lot of things I want but they are very, very pricy and their first party lens selection is a bit sparse right now. Do you guys have any suggestions for a nice small or mid sized camera with interchangeable lenses? Perhaps something a bit more affordable? Also, Final Fantasy 14: A Realm Reborn happened. Yeah... it was mostly FF14... By the way, I am Miette Patiss on Ultros if anyone plays FF14. That's all for now, I shall leave you guys until next time where I will do a photo shoot for an appropriately orange themed figure.